EDMONTON, ALTA. – An active market in the United States for used cars and trucks is keeping prices strong at Manheim, says Don Wallace, manager of the recently renovated Manheim Edmonton facility. “The U.S. can absorb the supply and maintain a robust price,” Wallace notes during an interview at the grand opening of the Edmonton location. In 2015, 200,000 Canadian vehicles from auctions and private sellers went to the U.S. buyers. Wallace says some vehicles were also sold to overseas buyers. The Edmonton auction sells an average of about 400 vehicles a week, he says. The location could handle more vehicles by adding lanes or auctions. “There’s lots of opportunity for growth,” Wallace said, pointing out that Edmonton is a strong market for new vehicle sales. While cars, trucks and SUVs make up the bulk of the units sold, Manheim also handles RVs, boats and motorcycles. After a three-year partnership, Cox Automotive Canada, through its Manheim Canada operation, acquired 100-per cent ownership of Manheim Source Edmonton earlier this year. Manheim operates on a nearly 10-acre site in northwest Edmonton in a building that was renovated to provide four auction lanes as well as two levels of office space. The Edmonton deal followed Cox Automotive’s addition of Manheim Vancouver in October 2015 as past of a strategy to expand its footprint into Western Canada. Manheim operates 133 auctions in North America, including five in Canada. A key part of Manheim’s services is the ability to turn over inventory quickly, Wallace said. Although many vehicles are consigned before the auction day, “if there is no reconditioning, we can have it in the auction the same day (it arrives),” Wallace said. 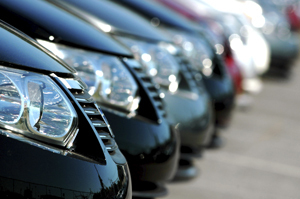 The ability to turn over inventory quickly is important to dealers. Manheim staff clean and detail vehicles before they go through the auction. But they can also arrange for any worked needed to present the vehicle in the best light possible, including repairs. “We can make the vehicle as ready as the seller wants it to be,” he said. In addition, Manheim provides financing when buyers need it and disclosure on vehicle condition. Disclosure is the same at all Manheim auctions, regardless of the province where the sale is located. 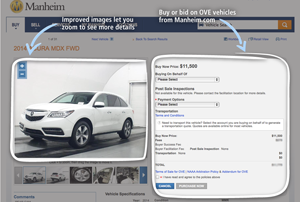 Before an auction, Manheim lists information about each vehicle online, including information about equipment and options, so buyers know about the units in advance. There’s been good acceptance of Manheim by local dealers and Wallace notes the focus is on serving local dealers.